You are probably reading this because you have heard of this Keto Diet Plan (also called Ketogenic or LCHF) and you wanted to check it out. Maybe you googled it or maybe you read the Huffington Post article that showed that the keto diet plan was one of the top ten searched for diet plans last year. In any case, you have landed in a friendly place where you can get started on this life changing plan. I’m not a Keto guru, but I know where I can find them. I’m not a chef, but I make some pretty mean Keto meals which I share on this site. And I’m not a doctor or a nutritionist. I’m just a metabolically broken person who has never had any success losing weight until I started following the Keto diet plan. This Getting Started page will offer you a few tips and tricks and a few resources to get you going. What is the Keto Diet Plan? The Ketogenic diet is low carb, high fat and moderate protein. Lately I have been trying to make my ratio 75% fat, 15% protein and 5% carbs. Most of my friends stop listening when they hear this and think that I am headed for the nut house. Read about how I first learned of ketogenic eating as a plan for epileptic children. But I soon learned that Keto was not just for epileptics! Use a Tracker. I use MyFitnessPal to keep me on track. You can change the ratios to target the ratios for the keto diet plan or anything else out there. I also use it to enter recipes so that I can figure out what macro nutrients are in each serving and then adjust them to get it right. Understand Ketosis. I say this because most people don’t know what it is and this will be their criticism to undermine your efforts. They will say things like ‘Ketosis is dangerous’ but what they are referring to is a condition called diabetic ketoacidosis. Nutritional Ketosis or adapted ketosis is when our bodies produce ketones in the absence of glucose. In the absence of glucose, our bodies use fat for fuel and this is the goal of the keto diet plan. I have super simplified this explanation! Stay Motivated. This is where I fall down sometimes. I start to believe my old stories about not being able to do it, I believe that old ‘everything in moderation’ lie (it’s a lie for sugar addicts like me!) and fall into old bad patterns. Stay connected with keto bloggers and forums. We are a nice bunch of people and we need you as much as you need us! 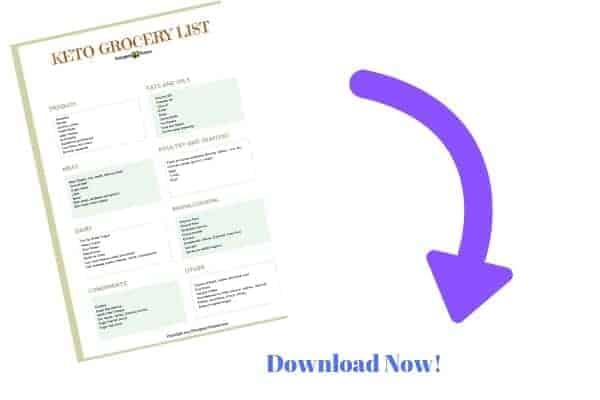 And just for reading this much, here is a Keto Food/Grocery list to get you started! I am working on a free basics of Keto ebook which I will send to everyone when finished. I would love to have you in my tribe but no strings attached! Hi, First, I just love your site, your advice, your awesome recipes & your wonderful personality that shines through as you answer endless questions with patience and knowledge. So Big thanks for all the time you spend helping so many people on this journey. My problem, I’m trying to get on your mailing list for recipes. I have tried 4 or 5 times but nothing shows up on my email. I’ve looked under spam & trash just in case, nothing. Can you please tell me what I’m possibly doing wrong? Btw, I Lost 14lbs from June to July 2018, just cutting out cakes & candy, & adding salads. Then discovered keto! Yeah! Started Keto in August 2018, down 51.5lbs as of today. From 268.7 to 203.2. Goal: Very Healthy or 140lbs, which ever comes first. Wow Virginia! Those results are amazing, good for you! I will contact the email company to find out why they are not collecting your email. I only just started this whole subscriber thing and have not done my first newsletter yet, so at least know you haven’t missed anything yet! Thanks for your support of my site! I was looking to starting the Ketogenic diet but I have high cholestrol and my LDL and HDL are also not within normal range. Would this be a bad thing for me to try. I have IBS and I will frequently get chest pains from gas which I think might be food I am eating. I don’t eat meat or fish. I eat potatoes, sweet potatoes, pasta, rice, smoothies with frozen bananas and blueberries with almond butter. I am now thinking all of this is causing my chest pains. I also have quit sugar about 2 months ago so no sweets. It’s good that you have quit sugar but unfortunately some of the foods you are still eating have a similar effect on your blood sugar as ‘sweets’. My mom is a diabetic and has been told by her doctor to not eat most of those foods you are eating. A good starting point for you would be to get familiar with the glycemic index of food. My mom has been told to stay at the low end of that index to keep her blood sugar down. Hey,, Kavitha here from india..
Am 27 yr old female weight (60 and height is 4’9), basically am fitness freak initially into yoga now into gym since i started for working, I do most of the workout and into diet also still its very difficult to reduce my weight, i dont have thyroid also. kindly sujjest me for keto diet but i have gastric problem. Well since you are quite small I would suggest following a keto plan where your calories are 1200, carbs are max 20 g total, protein is 100g and then the rest of the macros would be fat. Use myfitnesspal.com (free) to track that. Good luck! Hmmm, if you are losing weight with what you are doing then it sounds like not too much of a problem other than the leg cramps. I would not overthink too much and also know that what works this week might have to be tweaked in the future. I think mixing it up is a good thing and something that should be done often or your body becomes accustomed to what you are doing, which becomes less effective. For the leg cramps it’s usually an electrolyte thing. For myself I find that a nightly magnesium drink called Calm has done the trick for me, no more leg cramps! I wrote about that here. Maybe compare the ingredients on that to what you are taking because there are different magnesium supplements out there, some are more effective than others. Some people have figured out how to make their own electrolyte drink using salt, lemon and so on but I’m not that domestic so Google that if you are interested in it. I also keep a magnesium gel on hand for for the odd time that I feel a cramp coming on as it works in seconds! Don’t forget about potassium for leg cramps!! I get nervous about recommending potassium without checking with the doctor. Especially if you are on any meds like blood pressure meds. I agree, potassium is important but proceed with caution. NoSalt is a safe way to add potassium if one was not sure about their meds interacting. Hello, I am jumping back on the Keto style of eating, but did the Atkins, back in the day. Women need to add calcium to our diet when on these types (Keto, Low carb, High protein) of meal plans to prevent cramping. We still have to protect our bones. In addition, vitamin D will help your body absorb the calcium; if not getting enough Vitamin D from the sun or food, take a supplement, but DO NOT take the calcium supplement and Vitamin D supplement at the same time. Also, when taking calcium in doses higher than 250mg, calcium, and magnesium will compete for absorption. Speak with your health care provider to confirm what is best for you. I’ve lost 41# in 8 months doing Paleo. I have one carb thing per day on some days, and Sundays I give myself permission to eat whatever I want. Since going on this food program, I don’t crave carbs. I crave food! I eat veggies, meats, eggs, cheese, quinoa, coconut, almonds, and some spelt flour biscuits in moderation. I only really miss potato chips and potatoes…cauliflower is a good sub, but I think Jerusalem artichokes are better for a potato substitute. Hi Anita! Firstly, I’d like to thank you for putting together such a great website and sharing your journey with everyone. I’ve tried keto a few times, but seem to have fallen off the wagon a few times, but am determined to get on the wagon this time and stay on. Thanks again for sharing; it is stories like you that keep people like myself motivated. Thanks so much for your comment! Trust me, I have fallen off that wagon so many times! Getting back on is my only option because for me there is no alternative. Thanks for visiting my site! Ok so I’m new to the Keto diet and I’ve been doing it for 3 days now. I’ve been eating 59-70% of fat (usually varies). 22-32% of protien and 1-10% of carbs. My net carbs always been under 25 g. Is the fat percentage low? I think it’s high enough because I researched the diet before trying and the recommended fat percentage was 60% and above but so many people are eating 70% and above. I’m not experiencing Keto flu which is a great thing, but I do feel a difference with my body. Also is my macronutrients percentage good? If you get the results you are looking for then it is good! Three days is not really enough time to make a judgement call on that. Keto is a long term lifestyle as opposed to a diet, so see where you are at in a few weeks time before you start tweaking. Everyone is different and results will vary depending on age, activity level, hormones, weight, etc I have found for me that the #1 thing is keeping the carbs low. The protein and fat macros seem to be more forgiving but if my carbs go up, so does my weight. But that’s me! Hello Anita! I’m a 5’4, 145 pound, 20 year old female who works out (kickboxing) for about 1 to 1.5 hours a day. I’ve been on Dairy free Keto and doing 16:8 IF for about 3 weeks now and have gained 3 pounds. I was 142 when I started Keto. The macros I follow are 1207 calories, 90 g of Protein, 20 g of carbs and then usually around 80ish g of fat until I feel full. I meal prep ahead of time on Sundays so all my meals are planned and I don’t cheat. With lots of water, exercise, taking a multivitamin/B Complex/Green Tea Extract, dairy free (so no cheese or anything), or artificial sweeteners, I don’t know why I’m not losing any weight on Keto. I’ve seen this work for so many people and have been doing extensive research as to why it won’t work for me. Someone suggested upping my calories to 1324 calories and 80 g of protein with 20 net carbs, 103 g of fat and seeing how that goes so I’m implementing that change from today. I’m just saddened that I haven’t lost ANY weight on Keto when it seems to work for everyone else. I’ve gotten blood tests done as well and my hormones are fine. My goal weight is 120 so I do have a significant amount of pounds to go and would appreciate any advice from you! I have even stopped all nuts and nut butters because I read that those could be an impediment to weight loss. I’m considering doing an egg fast in a few days for 3 days to see if that brings about any change. Thank you so much for your time- your journey is SO incredibly inspiring and I would hope to some success on Keto. Open to ANY advice at all! Hello, thank you for your kind words! Eliminating the nuts/nut butters is definitely a good thing in the weight loss phase of keto. Many people inadvertently follow a maintenance type of keto. Common weight stallers are dairy (sounds like you are on top of that already), sweeteners, nuts and nut butters, chocolate and any of the processed low carb/keto foods such as bars and shakes. Stick to real whole foods such as meats, eggs, good fats and green veggies. With the exercising that you do I would look into if you are getting enough protein. I’m not really much of an exerciser myself so there’s a couple facebook groups that could probably give you more precise advice. Ketogenic Success is a good one. Good luck, I hope you are able to figure this out! Hello! I am a newer member to the keto world, so may want to take this with a grain of salt. The thing I have noticed the most when figuring out macros is that they base it on percentage. I have also always seen protein significantly lower than fat. As the KetoWoman mentioned above, she is consuming 80% fat. For example, my numbers are 70% fat (117g), 20% protein (75g) and 10% carb (38g). I also weight 145, but am 5’7″. I have often read that people do not lose weight on a ketogenic diet due to overeating (too many calories in general) or too much protein. Hope you find your groove soon! Just clarifying… did you say you lost 50 lbs since posting that your ratios were 75/15/10? Can I ask what your caloric intake was? I’ve now lost 110 pounds all together. Although I shoot for those ratios, I sometimes go for weeks without tracking them. I estimate my calories range from 1200-1500. Maybe too much protein vs. fat. If your working out that much then your gaining weight because your gaining muscle. Muscle weighs more than fat so your gonna gain some. Hi! Enjoying your website/blog. I am on day two of the egg fast. I really am enjoying it. But though I love eggs I know that I do not want to stay on this – not for thirty days. I have noticed I am halfway towards the keto diet as I am right now. Don’t enough pasta much any more. Though MAC and Cheese is my favorite dish, I have to at this point force myself to eat it. Sweets I love but can only have a bite or two. Bread to me is dessert. One slice or a biscuit. Beyond that I cannot tolerate more. And I love baking breads, cakes, etc. but I rather give the results away than eat it myself. So I have made up my mind to try the keto diet for a month. Are there any 30 days plans out there that I can use as a guideline? Thanks! Oh, I did just started following you on Pinterest! There is this 14 day plan from the Diet Doctor which is free and you could just follow it twice. This book is one that I am reading right now and it’s perfect for a beginner. I will be keeping it as a reference, it’s full of everything keto! It’s called The Keto Diet. Good luck! Thank you! This is perfect. Hi, I could not find where to ask this on the egg fast. I see that you can have SF syrup right? Can you have SF coffee additions like the SF Hazelnut syrups? The sugar free syrups count as one of your 3 sweeteners in a day. Because sweetener is a known staller, it is severely limited on the egg fast for best results. How about stevia? is it ok to use?Or does it cause you to stale also? Everybody is different so you will have to try it and see. Many people use stevia without issues. Exactly what do you mean when you say you set your ratios at 75/15/5? It does add up 100% 🙂 Thank you. I didn’t realize that cheese could be a Keto staller. I have several articles about the Egg fast on this site! Start with this one and go from there! I am on day 6 and have lost 2 pounds only. Trying not to think about that too much. Did notice that my wrists aren’t swollen, very odd thing! Please tell me various things that are good to snack on. Thank you! Can I eat canned salmon or tuna? And… do you know what the nutritional goals are for the other items are (besides fat/protein/carbs %) on MyFitnessPal? Absolutely canned tuna and salmon are great! Especially salmon, lots of essential fatty acids there. Fat, protein and carbs are the only things I concern myself with. But that’s just me. Does the 15% carbs include all the carbs in the veggies or is that just starchy carbs? All carbs consumed. Personally I am not able to do starchy carbs whatsoever, I keep my carbs well below 20 grams a day total. otherwise, I just don’t lose an ounce. Good catch I missed that! 15% carbs I would not ever lose an ounce! I’m trying to decide on an app to use. Does the MyFitnessPal app automatically figure the 75/15/5 based on your calorie input? How’s an easy way to figure those percentages? I’ve sent a request to join your FB page but haven’t been accepted yet. Thx for your input. I do use MyFitnessPal but I had to set up the ratios I wanted for myself. You can’t edit this in the phone app (as far as I know) but you can do it by logging into MFP on your computer. Are you talking about the Egg Fast page? There’s always at least 100 new people waiting to be vetted every morning and it takes time for the admins to work through the list. Hopefully it will be today! Yes, you can edit it on the phone app. I change my ratios on the phone constantly. Just quick FYI – you can change your My Fitness Pal ratios in the app now – Yeah!!!! I have been researching the keto woe for about 2 weeks and plan to shop and start this weekend. I am on a very tight budget. Any idea’s on how to do keto on a budget? I cannot afford the grass fed meats, organic foods so any advice would be appreciated! Oh I totally get that! There is no requirement for you to eat organic, grass fed anything! Eat eggs and regular ground beef! Eat whatever meat, butter, poultry and veggies are on sale. Eat what you can afford to eat. It is very doable on a budget. Good luck! If there is an Aldi’s grocery store near you, give them a try. I always get my best (and cheapest) produce there. I also like their meat department. The offer a money (no hassle) back guarantee on everything they sell. Aldi’s is awesome for grass fed beef, coconut and olive oils, and all the veggies that is on the keto diet and all at the best prices around. What is the best thing to eat before a work out? i work out every morning at 5:30 and find it challenging to know what i should be eating? I can’t eat that early so personally I would do a coffee whipped in the blender with butter and/or coconut oil. Drink it on the way to the gym for some nice quick energy. Hi, started a low carb eating on Monday, so today is day 4. Im in ketosis, according to the keyosis test strips plus I have synptoms such as headaches, constipation and a strange taste in my mouth. And hardly any appetite. Just wondering if anyone has advise for the constipation? I have metamucil here, but after reading the ingredients, I saw that contains 2 kinds of sugars. I drink enough water. Also with the headacjes? How long does this usually last? Hopefully someone has some ideas? Or suggestions? Oh those first few days can be rough! I use a magnesium supplement every night called Calm. It not only helps me with muscle cramps and keeps me regular! Oh, and definitely read my article about Keto flu right here! Good luck! How about psyllium husks in some water for added fibre? I eat canned artichoke hearts in my lunch and a half pickle. It seems to keep me regular after having 4 days of constipation after starting keto diet. I also take magnesium at night. The first step is to just eat real food like protein, veggies and natural fats. Think about eating steak, salmon and chicken, salads, cooked non starchy veggies and butter and avocado. Learn carb counts of foods. Nothing processed, no pop, sugar, pasta, etc. Sign up for MyFitnessPal.com (it’s free) and start tracking what you eat. Start with getting your carb count down below 50 a day. Good luck! The first step is to just eat real food like protein, veggies and natural fats. Nothing processed, no pop, sugar, past, etc. Sign up for MyFitnessPal.com (it’s free) and start tracking what you eat. Start with getting your carb count down below 50 a day. Good luck! I am trying to start a keto woe. I was researching recipes and found a meal plan that said there is a period of fasting with this diet. Is this part of the plan? I haven’t done that yet. Mostly just trying to keep all my macros distributed correctly. No not really. Some people do but it’s nothing official, that is their choice. I had gastric bypass in June of 2015 and so far I have lost 155 pounds. I have about 55 to go. I have always had gastric issues and I’m beginning to link them to certain foods like breads, pasta, lentils, rice, real sugar. I am delving into this new lifestyle of Keto. What I am wondering is how do we log and record recipes that are a mixture of things. How do you log based on servings? Do you just estimate or is it based on measuring before hand? I try to cook at home as much as possible. Plus I’m cooking for a family of 5 and I am the only one interested in eating like this. A lot of people use apps like My Fitness Pal. The main reason I log is not to track every little thing, I just want to make sure I stay below 20 carbs. For me that is ground zero. If I can do that, then I’m having a good day. Hi there…i am just jumping back on the egg fast..only lost around 4lb last time. I have been LCHF since January…really seriously for 4 or 5 months without any loss at all even on the days where keto sticks showed I was in ketosis…and then on and off since then …putting on weight pretty consistently which is very frustrating. I use supplements and don’t use any toxic chemicals on my body or in my home (its been 15 years now) but in the past 2 years…weight gain. Is there any advantage doing the keto diet, if you have high blood pressure ? I stumbled across your blog looking for egg fast ideas! I started today to break my stall. I have been eating keto for about 3 months now. Do you know if doing the egg fast for 3 days works better then 5 days? I am thinking of cycling if I have success on this as I still have a lot of weight to lose. I have PCOS and diabetic (type 2). Five days seems to be the optimal amount to get things moving again. Many people do egg fast during the week and then very clean low carb on the weekends. Thank you! Today is a hard day. The eggs are making me a bit nauseous so I switched it up and made a ‘soup’ for lunch with zero carb chicken broth, butter and eggs. I am not hungry by any means but I will keep plugging along. I may try making some cloud bread or some sort of pizza crust with cheese to help me. Try to stick it out, you’ve got this! You can use the cloud bread as a pizza crust. My scale hasn’t moved yet and it’s day 3 :/ I am eating 83% fat and balancing egg to fats evenly. I have one artificial sweetener a day and no diet pop. With the eggs and fats, my calories are over 1500. Is that ok? Well it’s hard to know without knowing anything about you. If you were calorie restricting before this then it might take longer to adjust. Medications, hormones, age, activity level all play a part. And besides all that, sometimes a big whoosh comes on Day 4 or 5. That’s about all I can tell you. I did get the woosh 🙂 3lbs down today. I was eating keto and not counting calories, just carbs. Yesterday I consumed 1800 calories which I was a little nervous about but all seemed good this morning! Thanks for your help! My family and I are just starting out, and this page is already very helpful. Thank you for taking the time to document this for us. Thank you so much for reading! Good luck! First of all THANK YOU SO MUCH for so much of an important information!!! I found answered to a lot of my questions. I just started Keto Diet and I am motivated and actually feeling good. I ordered 10 days Ketopia Ketosis for 10 days about a month ago and I fail at first. I have left a few Keto drinks that supposedly take your ketones level to the roof so I drink it in a morning now. I’m going to finish it since I have it but I’ll be on my own after that. I see some women struggle with giving up their wine. I have a different issue (maybe not an issue) – I love sunflower seeds. I eat tons of sometimes on a weekend or at night while I’m watching TV. I work in gym and my activity level is pretty hard corn. I have no problem giving up carbs… but not sunflower seeds (it is my drug). Please advice. It is technically fat… What would you say? And thank you once again! I’ll be following you on my journey! Best of luck everyone! I guess we all have our favorite things right!? I think you can probably find a way to have your daily fix and still make it work. There are definitely carbs in nuts and seeds so you need to check out the package you are eating, figure out how much you eat in a day and calculate the carbs. As long as you are doing it with full knowledge of carb count, then find a way to work it in. Oh and thanks for reading my blog! I just found your website. Very good read. I also had a look at the comments just to see what others were discussing and educate myself on different Leto experiences. I am just beginning my keto journey and a stall didn’t even cross my mind. My question is about the egg fast. I hate eggs!!! Well that’s not entirely true…..I love a boiled egg white but no yoke. Is there some other alternative or something I can eat in place of the egg yolk? If you are just starting on Keto then don’t worry about the egg fast and stalling. Do regular keto, keep it clean and you may never have to do the egg fast! The egg yolk is the most important part of the egg on the egg fast, so don’t even go there, LOL! Good luck! Hey there! Glad you found us! Were you able to get into the Facebook group? I wasn’t sure what name to look for in the list. Let me know so I can make sure the admins watch for you. Don’t worry about the dairy, most people do much better without it. Eat more fatty meat instead like bacon, rib eye steak, chicken with the skin on, eggs with butter. Hello, I hope this page is still being used. I just need some help. I am on my 4th week and am having extreme vertigo. had to miss school and work for 2 days so far. I’m not hungry so I am not eating enough calories. I hate having to stuff my face when I am not hungry. I have been taking 198mg of potassium, magnesium,fish oil, and a multi vitamin. I also am putting salt on my food when I eat. My mood is much more stable but I am tired all the time. My carb intake is from 10 to 30 g a day usually 20 though. How do I get to the FEELING GREAT part? Gee it is so hard to advise you here because I am not a doctor and really can’t give medical advice. If you are missing work and have vertigo I hope you will see your doctor. But as far as Keto goes be sure to get enough salt, use it liberally because people on low carb diets need more salt than normal. Dairy is not a great thing for anyone’s diet and I work to avoid it myself although I do love cheese. You didn’t mention how many calories you are eating, and keto does make you feel full because of the good natural fats. So you might be fine in that department, not sure. I would cook some bacon! You get salt and calories! Are nuts and nut butter okay on keto? I know its caloric but it’s like my staple. I haven’t eaten any bread, pasta, or refined grains, the only starchy foods I have had are chickpeas and butternut squash. I have two or three meals a day usually with foods like nuts, nut butter, spinach salads, and poultry. I only drink water and I go to the gym 5-6 times a week, cardio and strength training. I would say to use nuts and nut butters very sparingly, not as a meal but as a condiment. Squash and chickpeas are too high in carbs for keto. Focus on fatty meats, small amount of veggies and stay away from any processed foods. It’s more a change in eating habits than a diet. Good luck! Hi, I am going to start a Keto diet but I am lil confuse how much (quantity ) of chicken and eggs should i take. Bcz we should consume protein and if i take more chicken this will increase my protein intake as well. and I am doing gym also, so I am taking cellucore protein as well.. Please help. I am also reading Jimmi moore book and it clears most of my doubts but how much quantity should for i have no idea of that. While you are getting used to eating Keto, the best thing is to eat until you are full but not stuffed. Later when your body has adapted to low carbs and good fat and protein, you can think about tweaking things. I don’t know anything about cellucor protein, sorry! The Egg Fast is for people who are following a low carb plan and have hit a weight loss plateau. Here is the article that I wrote that tells you how to go back to that. Hope that helps! Hi there. I’ve been reading a lot about Keto recently, and really want to give it a try. I’ve run into a few issues however… I’ve used several online calculators, all telling me to consume a different number of calories, ranging from 1055 to 1650. Also, I’ve noticed that the protein intake is very low when I set my calories to say, 1200 per day. Low to the point where 2 servings of eggs and one 4 oz turkey burger put me over the limit. I’ve looked at some online meal plans, but the numbers are so much different than mine, they’re not helpful. Am I doing something wrong? Not to mention the added trouble of having so few carbs available, I’m not sure how to reach the fat goal everyday. You want to eat good fats, but 1/4 of an avocado already has 4+ carbs in it. For reference, the numbers that have been calculated for me average around 55 grams of protein, 15 carbs, and 91 grams of fat. Any advice would be greatly appreciated. I find all those calculators very confusing as well, especially when I was new to this. One thing to remember is that fat doesn’t have any carbs such as butter. Adding butter to your foods will up the fats without adding carbs. I think 1200 calories a day might be a bit low but I don’t know anything about your age, activity level, etc so I can’t really say. Also from what I have learned it’s more important to stay under on the carbs than it is to max out the fat. So if you have reached your limit of carbs then stay there and don’t worry so much about getting to a certain fat level because we also have the fat on our bodies to draw from. I hope that helps and doesn’t add more confusion! Is it a diet or woe? Just a little confused. I think it starts off as a diet for most people and then becomes a way of life. Nothing wrong with that! This is interesting- I am vegetarian and have basically been using volumetric for years filling up on low calorie veggies mainly, so the thought of switching to something more dense I find a bit frightening, because I do not do well when hungry! I tried keto a few months ago, though admittedly probably not strictly enough, and I did feel hungrier than I was really comfortable with, and I did push the veggie recommendations. This is something I could give a go though, probably sans cheese, and if I allow myself some greens at least… Thanks! Well, that would be quite a diet change and adjusting to a new diet can cause hunger. But the nice thing about keto is that the healthy fats and the protein will satisfy hunger far longer than a tub full of low calorie veggies. Thanks for visiting my site! Unfortunately, I don’t think you’ll get the results you want but you can always try. The egg fast works on the ratio of fat to protein so you need to keep 1 tbsp butter, coconut oil or mayo for every egg you eat. The only thing you can give up is the cheese and any artificial sweeteners. Let me know what happens! I talked the restaurant into making me a two egg omelet with an ounce of cheese tonight. resisted all of the bread and chicken and meat dishes around me and ate it happily.Hopefully if I stick to the plan steadfastly I can keep my beloved wine. All of my french and Italian friends do and they are thin! lost 4 pounds in 2 days! Awesome, would love to hear back from you in a few days to see how it went! Thanks for visiting and I’m happy that you are seeing some results by staying very low carb with the egg fast. I love that Costco carries Kerrygold butter now, it’s a quick drive over the border to Bellingham for me to buy it! Hi there i think i should cut out diary too as i think this mighg be contributing to my weight loss stall and not entering optimal ketosis, however, i find that with my cream i am able to achieve my fat content bug i also know its a main source of me going over on my carbs 🙁 any suggestions how i can cut the cream but add more fat to my diet? Thanks also where in Canada are you? I cant find kerrygold butter anywhere ! I started lchf on Jan 19 & lost 9 lbs 1st weeks but nothing since. I have not touched any bread, baked item, ride, potatoe, etc, since 1/19… I’ve been eating pretty plain, eggs/bacon some cheese for breakfast… I have meat for lunch with a salad or green beans. I don’t eat between meals b/c I’m not hungry. I have coffee with cream in the morning, most times with coconut oil or butter. I also have an 8 oz glass of raw jersey cow milk a day. Why am I not losing? Is it the milk? I keep my carbs down enuf to have the milk, I think. Thanks. From all of my time being an admin is various low carb groups, I can tell you that dairy is a major contributor for weight loss stalls. Do what you are doing, but omit the milk, cream and cheese for a couple weeks and see what happens. Keto is moderate protein so we are in agreement on this point. Well, my not so random answer is that you need to take a close look at what is in that. And I don’t mean just carbs, going Keto is more than counting carbs, and macros. It’s about getting really clean with what you put in your body. Sure, we all want that nice sweet thing once in awhile, but I know from experience that those coffee creamers are a daily addiction for people. How about some Stevia and plain cream instead? That would be a good start to reducing the number of non foods that you consume. Ultimately, you are able to do what you want (I can’t see you after all!). It will be one of the things you end up having to look at if you don’t get the results you were hoping for. Best of luck to you! I see you have options to follow you on Pinterest and Twitter. Do you have an email signup? No, I appreciate all my readers and because I don’t like all the emails I get when I join sites, I decided I wouldn’t use this site to build an email list. I just want to keep it casual you know!? I do have a Facebook page and Twitter, but even there I’m not good at updating it! The only thing I am good at is pinning my recipes to Pinterest! I know, lame. How many carbs should a person stay under a day to stay in ketosis? Im sure it depends on activity level and things like that. But on average is there an amount per day?? For myself I have to stay under 20 grams. It’s a good place to start if you are going for weight loss. Best of luck! should ( an older female) do Keto for a period of time before adding in the fast cycle? apparently that 19 hours is forcing the body to burn stored fats- not the incoming food. and you are not calorie restricted at all. within carb limits it seems combining them gives a double whammy as long as diet is LCHF. It sounds an awful lot like Intermittent Fasting. A lot of keto/low carb people do intermittent fasting so maybe look that up and see how it compares to the Fast-5. I have no experience with fast-5. Best of luck to you, I know how challenging it is to lose weight when we get older. No, I like IF, was just not familiar with what you were calling it. And hey, I’m just a working mom who does low carb, certainly not an expert! I don’t see any issues with it, and like I mentioned before a lot of Keto people do IF. I always recommend people do their research and try things. Sometimes this keto life is all about tweaking until you get the macros that give you the best results. Good luck to you. I have been on the lchf program since Jan. 2, 2015, and have not lost a single ounce. My upper abdomen is bloated, I have NOT eaten over 20g of carbs. Could my 2 glasses of dry, red wine be the culprit? Everywhere I read and look, says no, but I am really getting depressed. Should I resume my ballet workouts 3x a week? I am female, 5’6″, and 59 years old. I am also a professional cook and read labels, come up with original recipes that do not clash with the program. I get ample amounts of healthy fats and drink plenty of water throughout the day. What is my problem? Thanks. Do you drink 2 glasses of wine every night? If so, yes that is a problem! Are you doing net carbs or total carbs? For women of our age (the over 50 crowd) net carbs is a myth in my opinion. I am admin on 2 different LC groups and I see this over and over again. For you, I would suggest joining these groups on Facebook for more information: Ketogenic Dieters (they will help you determine your macros) and Mid Life Women Doing low Carb (support group). I know the struggle. best of luck to you. Hi I really like your web site. I do give those numbers on many of my recipes. I key the recipes into My Fitness Pal and then it’s easy enough for anyone to get them. The reason that I did not do it for the Lemon Danish is that the recipe was specifically shared for the Egg Fast group on Facebook (I’m an admin there) and we tell them not to count those things while on the egg fast. If I have some time this weekend, I’ll figure it out and come post them in the comments, but you could also do that as well. Thanks for stopping by! I am just wondering if there is a caloric intake that you stay around per day? I have on and off tried LCHF for the past year, but I have been unsuccessful and fell into my old ways. I know it works as I have had a few people in my life do it, and lose significant amounts of weight. They feel awesome and I am jealous. This time I am making it stick! But I feel like maybe I go overboard on things like cheese etc. So I want to be conscious of this. But I wondered if there was a caloric intake per day that you would suggest staying close to. I know your not really supposed to count calories, but I thought I’d ask and see what the response is. That’s actually a great question. I hear the same, don’t have to count calories, but I also hear from a lot of people, especially middle age women like myself, that calories actually do matter. I know someone will blast me for this, but the truth of the matter is that I try to stay around 1800 calories or less. And even at that, each pound lost is a struggle! But it is something individual so don’t use my 1800 calories as your yard stick, you might be a different age, body type, activity level, etc. Thanks for the great question! Hi, I have added your site to my Facebook group as I like your stuff. Thank you! I have been looking for a place I can go that helps women with the diet. You always hear about men and diets but for some reason they leave out women or don’t make it a priority. Also, when we reach a certain age what worked before may not work now. As in my case, over 50 and have a hard time finding info on eating for women of my age group. So frustrating. So glad I found you and your sharing your journey. I also enjoy Jimmy’s ketone book. Still reading but very helpful. Thanks again for giving us hormonal challenged women a place to go and get help! Yes, I am over 50 as well and I think there seems to be a point where a woman in this age group finds the weight loss journey to be very very slow! I really try to focus on my health and remember that it’s not a race. Thanks for coming by and leaving me your thoughts! I have been on the egg fast diet for11 days and I have lost 1 lb, I am following the diet to the tee. The keto stick says I have moderate ketones in my urine. I don’t think I will stay on this I hate being deprived of veggies or cream when there no results. I started the keto diet around a month ago wasn’t losing any weight so I started the egg fast, still with no results, has anyone else that you know of that has been thru this? I don’t know what to do, if you know of anything that will help PLEASE let me know! Are you on the Egg Fast Facebook page? I would encourage you to share your menu there because there are a whole lot of experienced egg fasters who can help. I’m on there as well and I learn new stuff all the time. Maybe one small thing could make the difference. I’d like to add just a little to KetoWoman’s recipe. I like to put in a little bit of fresh minced onion (maybe an 1/8 tsp) and a dab of yellow mustard. You can substitute a pinch of dry powdered mustard if you have that. If you like your egg salad a little sweet (I don’t but some do), you can add a little bit of no-sugar-added sweet pickle relish. For the purpose of the Fat Fast or the Egg Fast, a simple egg salad is 2 eggs plus 2 tbsp sugar free mayo with salt and pepper. I like a dash of paprika. Can’t get much simpler that that! I’ve been low carbing since 2000- I lost 75 pounds and kept it off until about 18 months ago… Now I can’t seem to get into fat burning mode- even after the Atkins fat fast. I’m going to give this a try! Be sure to focus on getting enough high quality fats. I did Atkins as well and I ate mostly protein and definitely not enough fat. If you are on Facebook, join one of the LCHF recipe groups, and if you are on Pinterest follow my Low Carb and Ketogenic boards. I try to post great recipes on there! Thanks so much for visiting my site!